I know; I was supposed to be back with a post on why I think bad reviews are valuable and worthwhile. It’s about 2/3 drafted, but I keep thinking of new things or changing my mind about existing things, and so I keep tinkering. At the moment I’m thinking of scrapping what I have and starting over. So I’ll jump ahead and talk about a smaller, more manageable subject: street teams. I’m all for people feeling evangelical about a book, including any and all of my books. But the street-team model presumes that evangelical response for every book. And that’s just not how reading works. There are people who loved my first book, but didn’t care for my second. There are people who liked the first two, but were disappointed in the third. There are people who loved all three, and probably at some point in the future I’ll write something that lets them down, too. So even in its most benign form, with an author who actively discourages attacking reviewers and who articulates a no-obligation policy, I feel there’s just too much built-in motive for artificial enthusiasm. And that’s not what I want, as an author, as a reader, or as someone who cares about the integrity of our genre and of books in general. 1) The blog has been silent for quite a while, I know. I’ve been in head-down writing mode. I’d always sort of shaken my head and pursed my lips when I heard writers talk about being too busy to read, but I’m off that high horse now. I have not read a full-length book for over a month. I wish, wish, wish I were able to write faster. I don’t believe prolific-ness (prolificity?) is necessarily a good measure of success, and I do think there’s such a thing as oversaturating the market with your stuff, but I’m still slower than what I’d like to be. 2) I went to Paris in September. It was a wonderful Trip of a Lifetime thing, starring my mom, who’d never been off the North American continent before, and co-starring my sister, my brother, and me. Mom is artsy beyond any of our ability to keep up, so we divided up the museum shifts, and she and I spent an excellent, not-long-enough day in the Louvre. I did some writing in Paris, so now I can say I’ve been to Paris and written there. 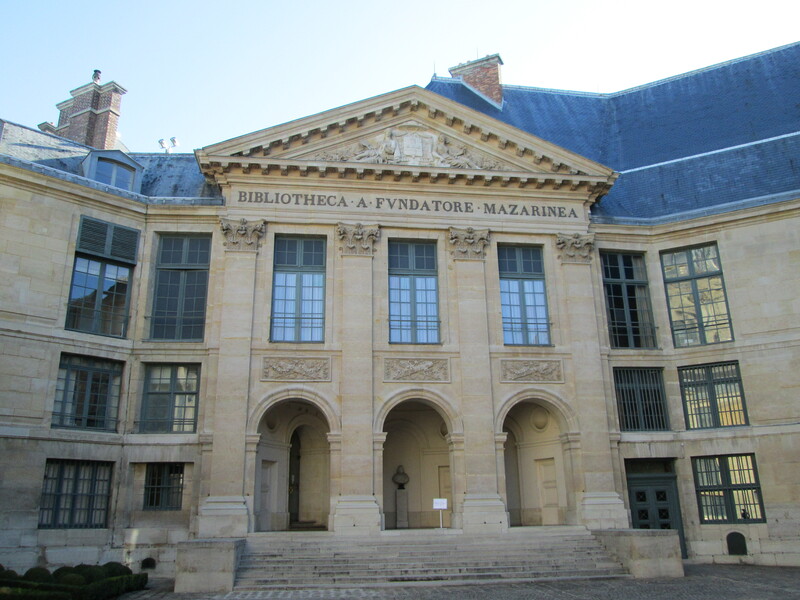 Mostly I wrote in a minuscule office in the flat we rented, but one day I walked up to the oldest library in Paris, the Bibliotheque Mazarine, and wrote for a little while there. Bibliotheque Mazarine. You have to stop at the office to get a visitor’s pass, for which you leave your driver’s license or other ID. You’re not allowed to take pictures in the reading room, but here’s a picture on a Wikipedia page. 1) This weekend I’ll be at the Emerald City Writers’ Conference, which is the annual conference put on by the Seattle chapter of RWA, in cosmopolitan Bellevue, Washington. In fact I should be packing right now instead of writing this, as the first workshop starts in just over an hour. Saturday I’ll be signing at the Book Fair, 4:30 – 6:00 on the 3rd floor of the Bellevue Westin Hotel. Actually this is open to the public, so even if you’re not attending the conference, if you happen to be near Bellevue then stop by! Lots of more-famous-than-I authors will be there, too. Oh, and I’ll have candy. Sunday morning I’ll be on the annual “Chapter members who became published authors in 2012” panel, AKA “How Did They Do That?” It’s at 8:00 a.m., so I’m expecting kind of a sparse turnout, but we’ll do our best to make it worth your while. I’ll give away books, and try to have edifying advice. Also, if you’re at the conference and just see me around, please say hi. 2) Author Susanna Fraser is going to be stopping by the blog on November 20 to talk about her upcoming release, An Infamous Marriage and to give away a copy. If you’re a fan of trad-flavored Regencies with a military emphasis, authored by someone who really knows her stuff, then you should be reading Fraser. And if, like me, you’re a fan of love stories that get off to the worst possible start, then you definitely need to read An Infamous Marriage. Okay, I’m going to pack now. Will try to send updates from the conference! I’m visiting with Melanie at the Bookworm2Bookworm blog today, talking about deleted scenes. I share a scene I cut from A Gentleman Undone, and talk a bit about the decision to cut it. Also, I’m giving away a copy of the book. Stop by and leave a comment for a chance to win!